River Breeze Wilderness offers comfortable self-catering accommodation in a lovely 11-sleeper home in Wilderness, situated across the road from the river. The property is conveniently located approximately 2 km from the beach, shops and restaurants. The house comprises an open-plan kitchen, lounge and dining area leading out to a large undercover patio with built-in braai facilities. Guests can enjoy partial views of the river from the upstairs balcony. The entrance level comprises a bedroom with a double bed and a single bed, as well as a dressing room and a full en-suite bathroom, and doors leading out to the viewing deck. There is also a guest toilet on this level. The downstairs level can be accessed via stairs internally, or externally through a separate entrance. There are 3 more bedrooms located downstairs. The first bedroom contains a double bed, the second bedroom contains a double bed and a double sleeper couch, and the third bedroom contains 2 bunk beds. The second bedroom has an en-suite bathroom with a shower, and the other 2 bedrooms have access to a shared bathroom with a shower. The kitchen is equipped with a fridge, an oven and stove, and a microwave, as well as a breakfast bar. There is a fireplace in the living area, as well as a TV. There is a lush garden with ample lawn space for the children to play, as well as access to the walkway along the river, which is ideal for swimming, canoeing or fishing. There is ample parking within a walled yard. The property is approximately 20 minutes from George and approximately 15 minutes from Garden Route Mall. 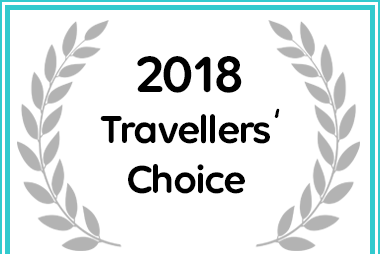 River Breeze Wilderness in Wilderness received a 2018 Travellers’ Choice Award.